We just celebrated her one month birthday, so I figured it was time to officially post her arrival here on the blog! Still can’t believe I have two girls, seeing as during the entire pregnancy anyone who had an opinion thought I was carrying a boy. I had mentally prepared myself for a boy. I was terrified to have a boy. But let’s be honest, I’m totally a girl mom and am thrilled to have someone who can now wear all of Parker’s hand-me-downs. Those fur vests and cowboy boots will have a second life! Sidney is a family name on Eric's side - it's his fathers and grandfathers middle name. Sloane is a last name on my father's side and a name I've always loved, especially after living in Chelsea by Sloane Square in London (my favorite city!). So what has the first month been like with a toddler and a newborn? Is it crazy to say it has surpassed all my expectations? Seeing as I was prepared for the worst. Literally, was meeting with friends before the birth and acting like I was dying. I would send them off and be like ‘Whelp, it has been real. Not sure when we’ll see each other again, but it’s been nice knowing ya!’. I thought for sure everything would be as difficult, if not worse, than the first time around... seeing as we also have a toddler in the mix. Sure, I’m zombie level tired and most days I smell like a mixture of breastmilk and dry shampoo, but I think I’ve found my ultimate happy place…… being a mom. Cheesy? 100%. Motherhood makes me feel completely unprepared and yet totally confident. It balances me out. It’s a reality check from all the unnecessary distractions we encounter every day, it reminds me where to invest my time and what really matters in my life. I don’t take it lightly. I had a lot of internal struggles with the concept of our planned c-section. Surprises are my favorite thing and I always envisioned that ‘ah-ha’ moment that women have when they realize they are going into labor. I’ve never had that. I did, however, have some Braxton Hicks with this pregnancy, which occurred conveniently while Eric was on the other side of the country. Nevermind that I freaked out and started packing for the hospital, thinking about who I’d want in the operating room with me if he couldn't get home. I didn’t tell him at the time, as to not alarm him, but he did come home to a bag sitting by the door packed with ‘necessities’ like toothpaste, one slipper, a phone charge, a candle, some mismatched pajamas and a swim suit. I was clearly thinking straight. So how has it been different? After the first week of Parker getting adjusted (read: throwing a fit at the drop of a hat), she has since mellowed out and is back to her old sassy and dignified self. We are back to life as we know it, just with an additional tiny human in the mix. My recovery was a million times easier this go around - thank god. Also, I fought for skin-to-skin post operation as soon as they could get her on me and kept her there in recovery and until we were admitted to our room. Now, I know every child is different, but Parker was terrible at breastfeeding until she was nearly four months old (read more on that here). Sidney Sloane has been a champ. She’s redeemed the nightmares I was having about these initial weeks. She’s shown me what it’s like to be in baby heaven and enjoy these first weeks. I missed a bit of that with Parker since I constantly had to hand her off to pump, she would cry every time I tried to nurse her and the logistics with pumping/bottle feeding made it hard to do anything on a whim. It’s amazing how much power the act of feeding our babies has over our lives and emotional well-being as a mother in these beginning weeks. I know the harder days will come once I’m dealing with a mobile baby and an energetic toddler, but for right now, I’m just soaking in these simpler days before the real chaos begins! I’m a believer in building a family narrative. One that encompasses both of our separate family traditions and also leaves room for us to build our own as our tribe grows. Our longest running tradition as a couple has been going upstate for apple picking in the fall. It is honestly the best thing ever…. seriously, ever. We used to go on weekend dates upstate exploring little towns, we got engaged and then married in one of those little Hudson Valley towns, we love the changing of the leaves, the crisp air and the perfect temperature, the apple cider with a side of apple cider donuts, the smell of the fireplace and….. I mean, you get the idea. We are very predictable city folk who yearn for a bit of country flair. 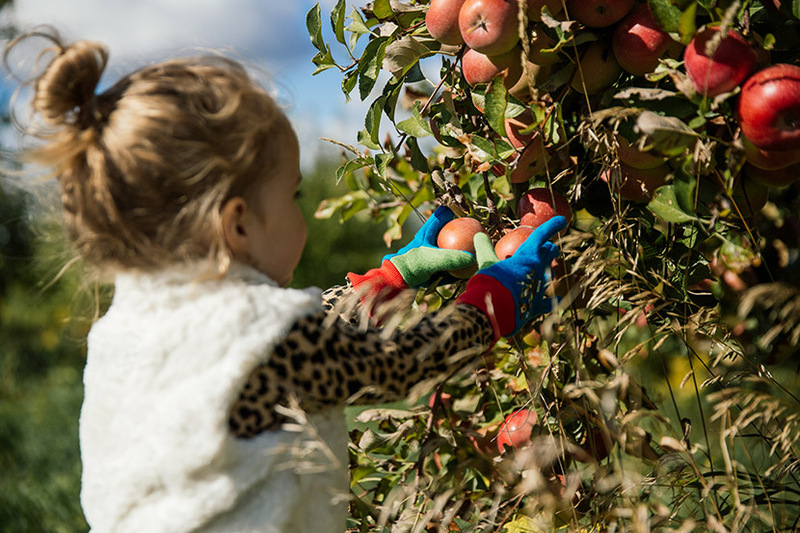 Some years we rent a house, gather some friends and make a whole vacation out of apple picking. It’s really the only way to fully experience the magicalness that is the New England fall season. It’s my favorite outfit season - layers and scarves, but not bulky jackets. It’s my favorite food season - all things pumpkin spice. It’s my favorite smelling season - all the candles are out and fire pits are a must. This is starting to turn into my love letter to fall. Fall, can you hear me? I love you. One of my wishes in life is to maybe live in a town where it’s basically fall all year around. Does that place exist? The past couple of years my dad has joined us and now this tradition has expanded to other parts of our family. It’s really neat! (Yes, I just said ‘neat’.... I guess it's like a mom thing.) I love seeing us creating and experiencing these memories together. I want them to be things our children remember when they are older and hopefully decide are something they want to do with their families - and then we can tag along!